Gettysburg, Pa. (April 14, 2019) – OPEN MINDS has released an updated suite of Medicaid market intelligence resources on the state of North Dakota. The resources include analysis of the North Dakota Medicaid system, Medicaid managed care vendor contracts, and additional state-specific information. North Dakota operates two Medicaid managed care programs—a primary care case management (PCCM) program and a managed care organization (MCO) program. The PCCM program serves the non-Medicaid expansion population. Members may choose their primary care provider (PCP). If they do not make a selection, a PCP is assigned. PCP’s receive a $2.00 per member per month case management fee. The MCO program serves the Medicaid expansion population (childless adults with income up to 138% of the FLP). Under this program, the state contracts with one full-risk capitated health plan, Sanford Health Plan. Medicaid expansion individuals who are medically frail, which includes individuals with serious mental illness, may enroll in the traditional Medicaid fee-for-service program. The North Dakota Medicaid Managed Care Contracts are available now for all Elite OPEN MINDS Circle members. Individual contracts may be purchased in the OPEN MINDS shop for $1,500 each. North Dakota Health Care System Landscape: An OPEN MINDS State Profile, which provides information on each state’s largest health plans, Medicaid expansion policy, health insurance marketplace plans, demographics, population health insurance coverage by payer, and more. North Dakota Medicaid System: An OPEN MINDS State Profile, which provides a detailed exploration of each state’s Medicaid financing system, including a review of the managed care financing systems, largest health plans by enrollment, key players in the state Medicaid department, and plans for future system changes and contract reprocurements. North Dakota Behavioral Health System State Profile Report, which provides a comprehensive listing of behavioral health benefits in the state, care coordination programs related to behavioral health, and behavioral health subcontractors for health plans. North Dakota Medicaid/Medicare Dual Eligible System: An OPEN MINDS State Profile, which provides an overview of each state’s dual eligible financing system, as well as the largest Medicare health plans serving dual eligibles and details on new initiatives involving the dual eligible population. The North Dakota suite of state profiles is now available now for the Elite OPEN MINDS Circle members. In addition, the OPEN MINDS team has a wealth of additional North Dakota-specific resources. 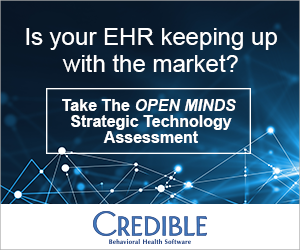 A monthly OPEN MINDS market intelligence update is available to all health and human services executives. To sign up, OPEN MINDS Circle members should set their email preferences under the My Account Settings.